So much yarn, so little time. : Descriptions: part three! Just a reminder that Descriptions parts one and two are well worth a read - each seller has a very different style. I'm in the process of editing all my descriptions in the light of what I've learned from these guys! 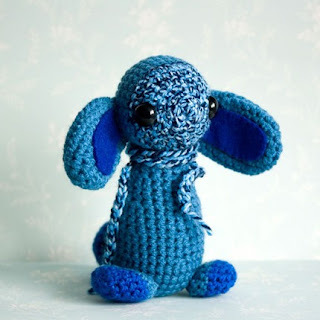 Today I'd like to look at CuteDesigns who (as the name suggests) designs and crochets the cutest amigurumi critters. Alongside our world a parallel world exists, rarely known to anyone. With every full moon a gateway is briefly unlocked between our world and the “Enchanted Forest”– a mysterious world that is home to little creatures who resemble some of the much-loved animals in our own… only with a difference. Nifty: I love this beginning! I'm expecting something (but I don't know what) very unusual, magical - I'm intrigued! A Leaf Rustler is rare to find as they are shy creatures who conceal themselves under fallen leaves and quickly scurry away if discovered. If you ever hear rustling in the autumn leaves, tread carefully as it may be one of these little critters. Nifty: Aha! So it's a Leaf Rustler - but what's a Leaf Rustler? And is there anyone out there who doesn't love crunching through the Autumn leaves? I adore Autumn, and leaf crunching is listed in my hobbies. I shall tread more carefully in future. This little Leaf Rustler measures approx 4.5 inches wide and 5.25 inches tall. (12 x 13.5 cms). It is crocheted using 100% acrylic yarn and stuffed with polyester filling. It has safety eyes to see with and felt under ear decorations. There may be very slight differences from the photo as it is totally handmade and no two can be exactly the same. Please note that the plushies at Cute Designs are collectables for older children, teenagers and adults and are not toys for young children. Nifty: I think cutedesigns has ordered her description very well - she's made sure we fall in love straight away, and then gets to the (still important, but no so interesting) business details - telling us about size and suitability, and making sure nobody is expecting an exact replica. Hmmm...might have to go back to the beginning of my own editing again! Want to see a Leaf Rustler? Of course you do! A follow-up idea has been suggested to me - if anyone would like to join me in a paired blog post (you don't need to have your own blog, we can do it just on this one if it's more convenient), the idea is this: each of us takes an item from the other's shop and describes it in a different style, and we look at before and after. Anyone feeling brave enough, please get in touch! I LOVE this series! This is just fantastic! This is fantastic! What a great idea! Cute's descriptions absolutely bring her creatures to life! Cute has a delightful way with words that draws you in. Perfect for someone who make cute little critters! NEAT challenge idea and I love--of course, lol-the scarf on the Leaf Rustler especially! I'm eternally torn between clever entertaining descriptions and descriptions that cram as much relevant information as possible at the top for the Google/SEO/ADD universe that stops reading after five words and gets alarmed when you spell out the word "five." PS- Hi, Nifty! It's been ages! This is a great series! Great job! Thanks Shay - JillHannah I'm honoured! I seem to spend my life editing - if it was an Olympic sport, I'm there. Wish I knew the magic, but like the fish, I just keep swimming. No, wait - editing, not swimming. Cute's description is absolutely magical! Now I need to go back and check the rest of the series. Not sure how I missed it in the first place.